There are 6 planets visible to the unaided eye: Mercury, Venus, Mars, Jupiter, Saturn, and Uranus. If you look down at the ground and count Earth, there are 7. The most difficult of these planets to spot are Mercury and Uranus. Mercury is so near the Sun that it’s always in a not-quite-dark part of the sky. You have to catch it right after sunset, or just before sunrise (depending whether it’s east or west of the Sun). It’s also the smallest planet, and not highly reflective. In all my years of doing astronomy, I’ve only gotten a good look at it a few times. Mercury (and Venus) are known as inferior planets. That means their orbits are inside Earth’s orbit. You will never see Mercury more than 28° from the Sun, which is its point of greatest elongation. For Venus, that number is 45°. The graphic shows the orbit of Mercury to scale, both above and below the horizon, to help you visualize what I’m talking about. Mars is also in this part of the sky, and can help you find Mercury. Over the nights of February 6-8, Mercury will pass extremely close to Mars, just to the right (north) side of the Red Planet. This is called a conjunction, which means they will have the same right ascension (RA) coordinates in the sky. The two will be a mere 0.3° apart (about half a Moon diameter). The color difference will be obvious — Mercury will appear grayish by comparison, and somewhat brighter than Mars. Actually, Neptune is also in this grouping, but not shown in the chart. You’ll need a telescope (or very good binoculars) to see it. On the night of February 6, the three will form an evenly-spaced line with Mars at top, Mercury in the middle, and Neptune at the bottom. If you do spot Neptune it will appear as a very small dot, pale blue in color. Mercury seen through a telescope is not that great an object. Very little detail is visible, even in good scopes. At greatest elongation, however, you should be able to see that it shows a “phase” much like a Quarter Moon. The lit side, or course, faces the Sun. The dark side faces away. Venus also shows this phase effect. On the night of February 11 these planets will be joined by a young Crescent Moon, which will be a barely visible sliver just beginning its waxing phase cycle. The Moon is New on February 10, so it will only be around one day old and a challenge to spot in this dusky part of the sky. 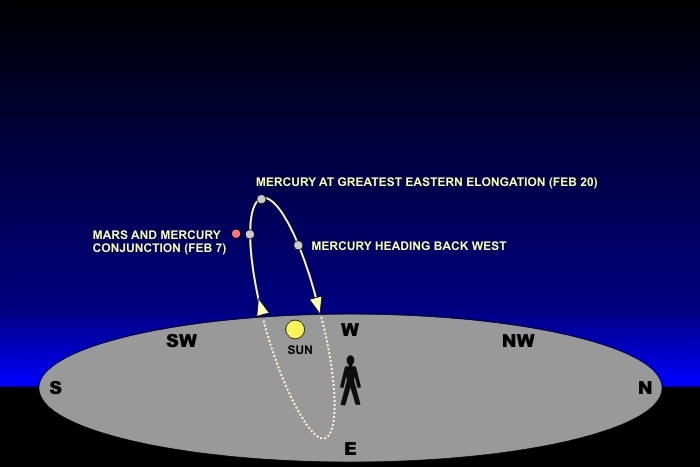 So take this opportunity to test your observing skills, and perhaps see Mercury for the first time. If you look for it a few nights in a row, you’ll see why it’s named for the wing-footed messenger of Roman mythology. It’s fast, and visibly changes position from day to day. Speedy Mercury completes a full orbit around the Sun in a mere 88 days.